DNA microarray technology is a new and powerful means of analyzing genomes and characterizing patterns of gene expression. Its applications are widespread across the many fields of plant and animal biological and biomedical research. This manual, designed to extend and to complement the information in the best-selling Molecular Cloning, is a synthesis of the expertise and experience of more than 30 contributors—all innovators in a fast-moving field. 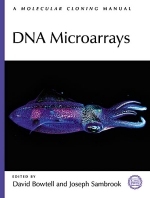 DNA Microarrays provides authoritative, detailed instruction on the design, construction, and applications of microarrays, as well as comprehensive descriptions of the software tools and strategies required for analysis of images and data. David Bowtell, Director of Research at the Peter MacCallum Cancer Institute of the University of Melbourne, is a leader in the use of microarray analysis for gene expression profiling of human tumors. Joseph Sambrook, F.R.S., leader of the Gene Biology Group at the Peter MacCallum Cancer Institute, is the primary author of Molecular Cloning, the world's best-selling laboratory manual for molecular biology. Please click here to see the complete list of contributors and their affiliations. an expansion of the material found in the print edition of Appendix 1, Generation of Full-length Libraries by Piero Carninci. links to other databases of value to working scientists. selected figures from the book for use in troubleshooting. selected tables from the book.